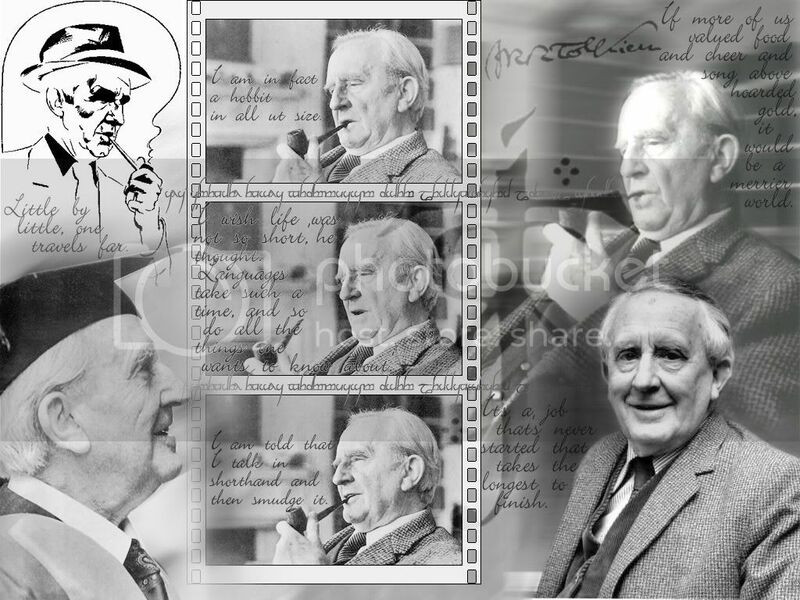 y golly, it's been such a busy week I almost didn't get this posted on time, but here it is: a little Tolkien and Frodo manip, a wonderful poem written for the Professor's birthday by jan-u-wine, plus a Tolkien wallpaper by ina86. I couldn't resist putting these two together at last. Pardon me if it is a little tongue in cheek. But I have always imagined scenes like this when I read Tolkien's remarks about how his characters seemed to take on lives of their own, leading him into the narrative, instead of the other way around. 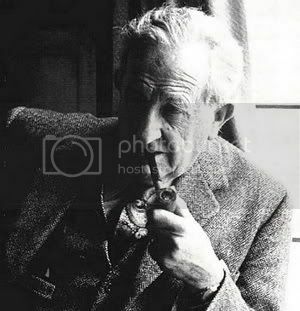 I found this simply looking up "Tolkien" on Google Images. It was featured in an LJ, so I was able to ask the artist's permission to use it for this entry. She has graciously consented. 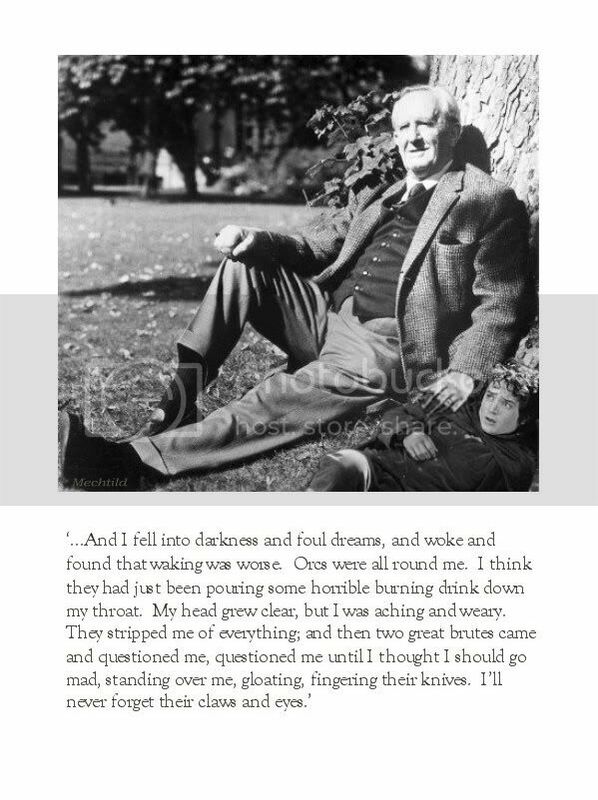 I love the bits of Tolkien-talk she has chosen to go with the images. I love the way jan-u-wine reflects on Tolkien in this poem, especially as a writer who loves crafting with words. From one word-lover to another, here is Jan's eloquent tribute to the Professor from 2008.
tongs or fire or pincer'd chisel. in the letter'd gift of his love. *far from the meaning we now assign to it (of a relatively worthless object, which no one wants), the definition of "mathom" is "treasure". I'll tell you everything I've learned, and love is all...he said." smiðr – Old English for smith. A complete collection of jan-u-wine's LOTR poems may be found here. Bless you, darling Mechtild and ina86!! without him my life wouldn't be half as wonderful!!! I can't thank him enough, either. I wish I could have done so while he was alive, not that there weren't loads of people writing him fan mail and showing up on their doorstep after LOTR was a best-seller. I would love to have told him or written him personally. Thank you so much for sharing, not just your cute manip, but the others' contributions as well. Tolkien is always better celebrated together :). 117 years since his birth...far too short a time, but alas, the years keep flowing by. It is indeed "far too short a time". I think his legacy will last as long as works of English literature are still read. Thanks for stopping in, Mithluin. Very nice poem!~ Jan-u-wine's poetry is great! Yes, let's raise our goblets to the Professor! Speaking of jan-u-wine, great writer of LOTR poetry, she's toasting the Professor tonight (the L.A. Tolkien society gets together for a birthday toast each January). I told her to lift her glass for me, too. Oh, that's a great manip--poor Frodo! And thank you for the link to Jan's collected works--I was hoping there was such a place--have bookmarked. "Why is he riding a mammoth?" HAW HAW HAW HAW HAW HAW HAW! But I'm glad you got some smiles. It makes doing the photos so much more fun. I'll have to look at Bingo's latest tomorrow. I'm all in tonight. Thanks for stopping by for a virtual toast, Lavender! Doesn't bear thinking about it, does it? Not that we'd know what we were missing. But SOMETHING would be missing from the world, something wonderful, if Tolkien had never written LotR. LORD OF THE RINGS FOREVER! You're a trusty and true admirer of the good professor, for sure! Thanks for reminding the more sloppy among us (including me!) and also for the pic and poem. How are things going? Have the 2 lil cats arrived at their new home yet? I do love the Professor and his works, yes. I appreciate so much what riches he has brought, little knowing that would be so, but just ought of love for the world, its characters and its language. Yes, the kittens have arrived. That's why this post says so little. We've had guests and stuff, too, but mainly I've been involved in cat care. On Christmas Day I drove to WI to get them. The breeder let me go ahead and have them, finally, even though they still have colds, but with the balance of payment due in the weeks to come, assuming they recover completely. I thought they might do better with three humans giving them the care they need exclusively, in a cleaner setting (a whole house instead of a 3 x 5 enclosure). The breeder could use the respite, too. Our two kittens were the last to get sick and the last to recover. I'm glad she suggested this, but it's time-consuming, making their food (homemade diet), dosing them twice a day, supervising them with Angelo while they learn the house, etc. It's been fun, of course. When things settle down I'll make some posts with pictures. Thanks for asking, Maeglian! A wonderful birthday tribute for the dear Professor, Mechtild! He has given us so much joy, hasn't he? Mechtild, I always love to read your posts and this one is again such a marvellous collection of art and poetry. Thank you to all involved and thank you to you for putting the parts together and posting them! You are welcome, Aredhelebenesse. I'm so glad you enjoy the LJ with it's Tolkien and Frodo stuff to the fore. Did I tell you I showed the animated firewords-over-the-Ephel-Duath (or are they still in the Emyn Muil? I am not quite sure where that image is set -- was it actually in the film? -- this coming from someone who's seen them so often -- shees!) to my husband and daughter. They loved it and marvelled at the craftsmanship and imagination that made it. Such a lovely tribute, my dear!! And of course it was almost time to see Frodo and Professor Tolkien himself together in the same picture! I should see if there are any illustrated books on Tolkien at the library. None of my books have an image worth scanning (that is, that would be any better than what I've found of the same images on line). What a lovely post, Mechtild. I'm so happy to hear that the kittens are home at last. I'm sure they will thrive with your loving care, and it sounds as if 'Uncle' Angelo is already being won over by their charm. I love your manip, with the Professor's hand resting reassuringly on Frodo's shoulder. Thank you for noticing, Blossom. I actually had to borrow that hand from another of his pictures. The one in the original didn't have the fingers extended, which didn't look right to me. Jan's poem is short but gorgeous, and the wallpaper really is lovely. It isn't showy, all in black and white, but the more you look at it the more interesting it is. Yes, Uncle Angelo presided over their bedtime last night. They were so cute in their big tent-bed! Speaking of the kitties, it's time for their evening meds (anitbiotics orally, plus nose drops, eye drops and eye ointment). I feel quite the veterinarian. But they are getting better. They've been playful all along, and great eaters. It's their cold symptoms that have been dragging on and on. But we are determined to wait it out! That is a clever manip, Mechling. Hi, Estë! I'm pleased you enjoyed the post, especially the poem. The poem was the main thing. I made the manip to draw my regulars who need to have an illustration before they'll open a post. Not that it wasn't fun making it, of course!